Newcastle manager Rafa Benitez, doesn’t seem as impressed as everybody else with the whole Pep Guardiola hype in the Premier League. Manchester City manager Pep Guardiola is the talk of English football right now, in a similar way that Rafa Benitez was ten years ago when he was coaching that impressive Liverpool side that won the UEFA Champions League in 2005. The Catalan manager made history by winning the very first Premier League with over 100 points in history, the man has continued the trend by being a dominant force in the league this season and he keeps faithful to his offensive style that everybody recognizes today. But Rafael Benitez doesn’t seem to get what all the fuzz is about, he actually just threw a little bit of hate towards the former Barcelona coach as he thinks the concept of him being the best manager in the world is mainly due to the hype. This notion moves far away from Jürgen Klopp’s most recent praise towards Guardiola when he said that the Citizens’ manager is the best manager in the world, Rafael Benitez has zero chill with the whole excitement created around Pep. It’s almost as if Rafa Benitez got alined with many of the Real Madrid fans who have always criticized Guardiola’s style, the same ones who praised Jose Mourinho’s defensive style above Pep’s and the same ones who deem the Catalan manager’s unique approach as ‘boring’ due to the excessive horizontal passing during a match. 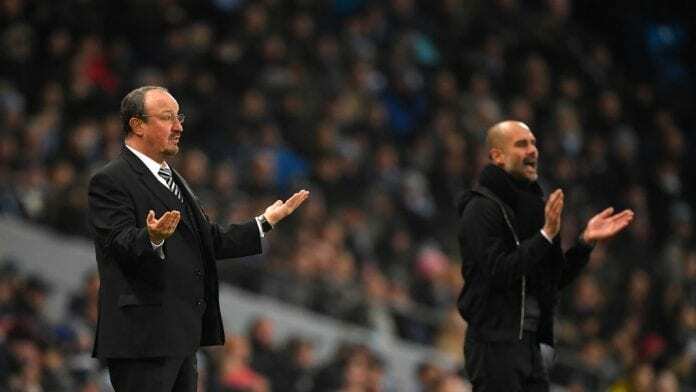 Rafael Benitez who has brought Newcastle United back from the dead after a terrible start of the season, recently spoke to The Times during an interview and expressed his controversial views on Pep Guardiola’s overwhelming idolizing. “I have seen teams play so offensive and so well down the years that it’s not fair to say that,” said Rafa during the interview. “But there are other teams with different styles of football winning in other countries, so there are different ways to win in my opinion,” he concluded. Knowing how poorly Pep Guardiola tends to react to praise directed towards him, we can honestly say that he will agree with Rafael Benitez’s assessment and also confirm that the Catalan manager doesn’t really think that highly of himself unlike other managers such as Diego Simeone or Benitez himself. Guardiola’s style has always been more linked to a man who tries to keep a low profile and let the results speak for themselves, but the reality is that the vast majority of authorized voices on the matter already see Pep as one of the best managers in football history. Even legendary Sir Alex Ferguson has repeatedly praised Pep Guardiola’s irruption in world football, and the overwhelming majority of experts do think that the man has brought a fresh take to English football that hadn’t been explored in the country yet. But more importantly, we can tell Guardiola is one of the good ones by looking at the whole combination of his stats, trophies, and the way in which his players have changed the way they understand football. Pep Guardiola has been nominated for November's Premier League Manager of the Month award after City won all 3 games last month, scoring 13 goals and conceding just 2. Why do you think Rafael Benitez spoke about Guardiola like this? Please share your opinion in the comment section down below.